On July 14th. 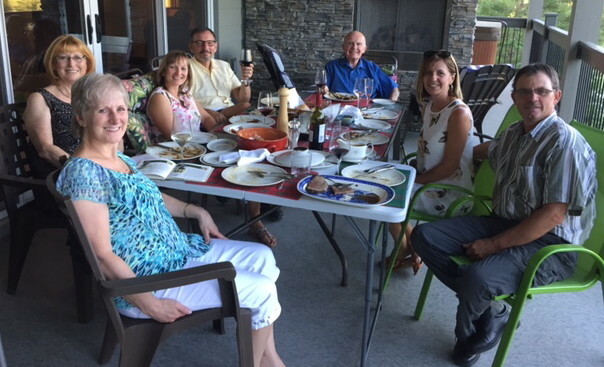 club members Ross and Fiona hosted Phil and Linda Briddon from Calgary, Darcy and Chris Johnston, and Carol and Doug Murray for a “Taste of Scotland” dinner. The event took place outdoors in very un-Scottish 25 degree dry weather; the mist was all in the glass. The traditional fare, which included smoked salmon, haggis, traditional tatties and neeps, and Tipsy Laird Desert was presented on a tartan table, and Burns’ Selkirk Grace was read. It was a great night for all and showed that fundraising is not just work but presents opportunities to experience fun and new friendships.